My home studio is based out of Cambridge, MA. It is easily accessible via public transportation (take the Red line to the Central Sq T Stop or the 1 Bus) and by car. In this personal environment, you’ll be under the watchful eye of a classically and comprehensively trained Pilates instructor who will lead you through a 55 minute private session on the mat and Gratz reformer. The reformer that is used during private sessions is from Gratz Pilates. 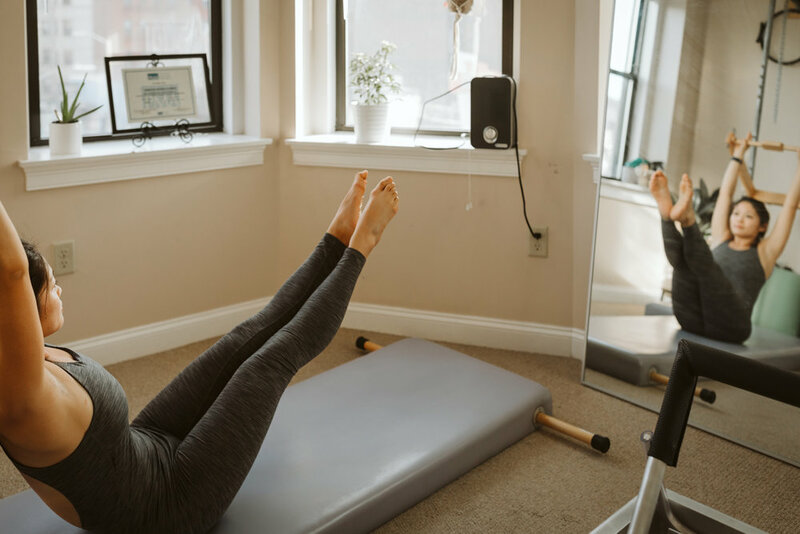 This piece of apparatus is the most similar to Joseph Pilates’ original equipment, thus helping you get the most out of your authentic Pilates workout. Gratz Industries is the original manufacturer of Pilates equipment and is well known in the Pilates community as the most authentic brand of Pilates equipment. Each private Pilates session is 55 minutes long and is conducted on the mat and reformer. At the start of your first session, after taking into consideration your injuries and past medical history, I will assess your mobility, flexibility and posture. We will identify your fitness goals and build a plan to help you move towards them. Expect to feel revitalized, stretched, and sweaty after your first session! I suggest wearing athletic attire and going barefoot. Set up your first session today! Please note that you may request a session time via Calendly but a session is not confirmed unless you receive a personal email confirmation from me. Christie's private Pilates session was my first experience with Pilates. Her home studio is inviting, clean, and well-maintained. I felt comfortable with Christie as she guided me through the Pilates flow. Her simple explanation, consistent coaching cues, and warm personality made our private session exponentially more valuable than a group class. Even as a fitness professional myself, it was beneficial to work with Christie because she is a second pair of eyes that catches tweaks about my body and form that I don't. Christie is well-trained and it is evident through her coaching style and technique, and I can't wait to work with her again! After working privately with Christie twice a week for over a year, I can confidently recommend her to anyone looking to increase their flexibility, balance, and core strength. She is able to effectively use her knowledge of the Pilates Mat and Apparatus to build a challenging, customized workout. Although I see her twice a week, I never get bored as every workout is different from the last. She is efficient with our one hour session making this a great workout option for anyone short on time. As someone who thrives on group classes and lifting heavy at the gym, I was skeptical about doing Pilates privates at first. But, after working with Christie, I’m totally sold on incorporating private Pilates into my routine. Christie is an amazing teacher who works with you to make each workout challenging. As someone who loves an intense spin class or lifting session, I was nervous Pilates would feel too easy but, Christie makes each workout different, I leave the session feeling stronger in my core and stabilizing muscles. I’ve found that it’s the perfect balance with lifting. I’d highly recommend Christie as a Pilates teacher. She is very experienced , knowledgeable, and an all around great person to be around. Do yourself a favor and RUN don’t walk to a Pilates session with Christie.